This kind of crazy stuff only happens at the highest levels of the United States government. In different decades people would call it “Treason,” but in today’s world…nothing. Here is today’s UTT Throwback Thursday. A look back at some news that matters in this war. To be “bipartisian,” Mrs. Clinton also had her own part in this. As Secretary of State her office coordinated the shipment of weapons/arms from Libya to Syria that went to ISIS fighters. Ambassador Stephens, who was killed in Benghazi, met directly with Belhaj. Adbelhakim Belhaj is “moderate” – just like Abdurahman Alamoudi, Anwar al Awlaki, and all the rest who turn out to be Al Qaeda or ISIS after they have worked with the U.S. Congress, White House, and everyone else in our government. Where do you even go with this? Dr. Vahid Majidi is an Iranian-born Muslim. He was the FBI’s Assistant Director for their WMD Program from 2006-2012? And Iranians are very proud of him. Don’t worry though, Dr. Majidi is no longer with the FBI. He is now the Deputy Assistant Secretary of Defense for Nuclear Matters. Somewhere in Tehran, Islamabad, Riyadh, and elsewhere in the Islamic world, Muslim leaders must be laughing uncontrollably at how easy this war is for them. John McCain’s conduct portrays an affinity for Islam & ISIS in more ways than one i.e. : a) by having served in the Senate during several of its last eighteen sessions (88th thru the 104th) during which the federal government was being incrementally polluted with Muslim-Brotherhood terrorists to the detriment of national security & safety of the American people, and said nothing to stop it; b) by his ostensible reluctance to respond to an erstwhile assertion of a “Freedom Watch” posting that while in captivity in Hanoi he may have provided the enemy with U.S. intelligence, to the detriment of national security & safety of the American people; c) by his public display of moral cowardice involving a demonstrably specious attempt to repudiate irrefutable revelations by former Minnesota Congresswoman Michelle Bachmann regarding the existential dangers Islam poses to national security & safety of the American people, and d) by his self-serving support in the interest of political tenure funded by the military industrial complex’s corporate profits, which without a never ending succession of pre-planned wars, thus more cannon fodder drenched mainly with the blood of American youth, would send the likes of John McCain into retirement and “turn their swords into plowshares”, or go broke! Furthermore — given the human inability to view the world from any perspective but a personal one — a common paradox exists when accrediting the term “Hero” to others, which according to Wikipedia essentially stems from how much similarity [or perhaps camaraderie] exists between individuals. Though, notwithstanding said limitations, I believe America’s real heroes are the U.S. Marines, army infantrymen and variety of special forces personnel who with their boots on the ground and a weapon in their hands engage in mortal combat each day with the Islamic savages who seek our destruction. 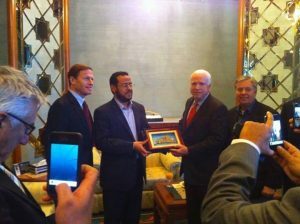 John McCain and his senatorial cohorts shown engaging socially with AQ/ISIS Leader Abdelhakim Belhadj for a photo-op, are clearly flirting with treason, thus constitute a symbolic threat to national security & safety of the American people. I am so disappointed the the Republicans to today. They are not doing the jobs, we the people, sent them to Washington to do. I always wondered why he was such a “milk toast” when he was running against Obama. Now we know why! The Republicans need to wake up and go back to what the founding fathers stood for. We are the laughing stock of the world!!! The functional details, procedures and personnel deployments being used to head-off, thus prevent, Weapons-of-Mass-Destruction attacks in the United States and elsewhere are — and should remain — the top-secret business of the FBI. Furthermore, since the delineation of contextually superficial rubbish he chose to provide to WMD-Central on 29.07.11 lacked any specific reference to the core issue involved (I.e. 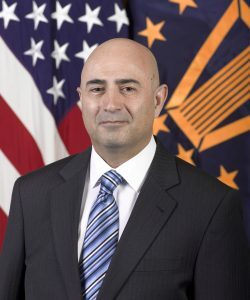 U.S. national security) Vahid Majidi should have been asked whether he or anyone else to his knowledge, associated with his Directorate either here or abroad, was a Sharia adherent Muslim; for if that were the case, his position then (and now), given America’s ongoing existential war with said homicidal2 psychopaths, equates to the provision of aid & comfort to an enemy in time of war, which constitutes treason.